I have been advocating for three years now the thermal insulation of buildings as one of the best ways to decrease our global fossil fuel consumption and greenhouse gases emissions. 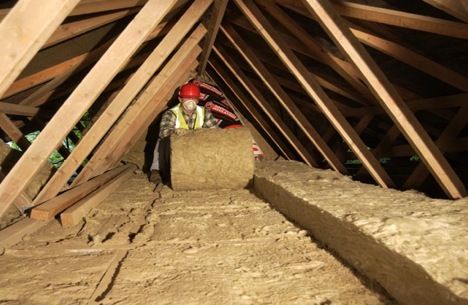 This week, the United Kingdom, Australia and the United States plan to insulate millions of buildings. These operations will be financed by the local governments and are part of what one could call a green stimulus plan. These investments are highly profitable and benefits the people, the environment and also the balance of trade (less fossil fuels imports). The British Government just announced that it will be offering eco home makeovers for over 25% of its residents (roughly 7 million homes and flats) as one way to reduce carbon emissions and help with fuel costs. Insulation will be updated and homeowners may be encouraged to look into solar panels and/or wood burning stoves, reports the Guardian. Roughly 1/3 of the country’s emissions could be cut after all improvements are completed estimated to occur by 2020. But there’s a catch. The new program will create thousands of jobs across the nation, improve energy efficiency to save money, as well as, cut back on one emission sector that accounts for roughly 27% of the country’s carbon emissions. These improvements won’t come without a hefty price tag for the government. While Prime Minister Gordon Brown designated $1 billion pounds for the project, its likely to cost more like $2 -12 billion each year to update insulation and small renewable energy projects at all of these homes. The Australian Government is stepping up its commitment to the environment by installing ceiling insulation in 2.2 million homes— for free. The Government will also increase the rebates for solar water heating from AUD$1000 to AUD$1600. Australia’s initiative will reduce greenhouse gas emissions by 49.4 million tons— the equivalent of taking over one million cars off the road every year. In addition to providing long-term environmental benefits, the plan will also give the economy a much-needed boost. The Australian Government is spending billions of dollars over the next two years in an attempt to strengthen its economy. When people suggest that, “What a waste of money to make federal buildings more energy-efficient.” Why would that be a waste of money? We’re creating jobs immediately by retrofitting these buildings or weatherizing 2 million Americans’ homes, as was called for in the package, so that right there creates economic stimulus. And we are saving taxpayers when it comes to federal buildings potentially $2 billion. In the case of homeowners, they will see more money in their pockets. And we’re reducing our dependence on foreign oil in the Middle East. Why wouldn’t we want to make that kind of investment? Now, all this is great, even fantastic. Yet, I am not satisfied. Indeed, even if the among the pledges of the Grenelle de l’Environnement there was something on the this very topic, the French government is not moving, or at least not as fast as it should. Even more: I believe the whole European Union should begin such a program. It would decrease the threat of Russia cutting its natural gas exports and would enable Europeans to save billions of money and pollution. By taking advantage of the free insulation, it will help reduce the amount of energy we use up to 40%, which means we can save between $200-$700 per year on electric bills.